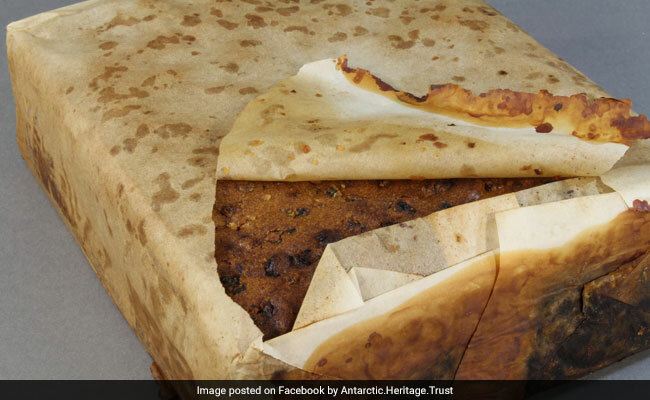 A well-preserved fruitcake was found in a hut in Antarctica. An indestructible fruitcake withstood one of the coldest, driest places on earth for a century to emerge '(almost) edible'. Conservators from the New Zealand-based Antarctic Heritage Trust discovered the 106-years-old treat in a hut on Cape Adare in East Antarctica. According to a statement released by the trust, the cake probably dates back to the Terra Nova expedition of 1910-1913, led by British explorer Robert Falcon Scott. Made by Huntley & Palmers, a company that has been in business since 1822, the cake was found 'still wrapped in paper and encased in the remains of a tin-plated iron alloy tin. "...finding such a perfectly preserved fruitcake in amongst the last handful of unidentified and severely corroded tins was quite a surprise. It's an ideal high-energy food for Antarctic conditions, and is still a favourite item on modern trips to the Ice," said Programme Manager-Artefacts Lizzie Meek. "Living and working in Antarctica tends to lead to a craving for high-fat, high-sugar food, and fruitcake fits the bill nicely, not to mention going very well with a cup of tea," said Ms Meek in a statement to the National Geographic.